The dazzling mixed-media works of Mickalene Thomas (b. 1971) combine rhinestones with acrylic and oil paints to create compositions that often reference iconic works of art from nineteenth-century Europe. In her reimagined renderings, the artist replaces the European subjects with powerful and glamorous African American women, inviting questions about conventional beauty, racial identity, and the traditional art historical narrative. Thomas first became interested in creating a dialogue with progressive nineteenth-century artists such as Claude Monet, Édouard Manet, and Gustave Courbet after completing an artist’s residency at Monet’s home in Giverny, France, in 2011. During her time in Giverny, Thomas was influenced by the realization that Monet had carefully appointed his residence and gardens to create the ideal creative retreat. The collage effect apparent in Thomas’s Giverny landscapes and interiors mirrors Monet’s desire to piece together spaces as individual sites of inspiration. 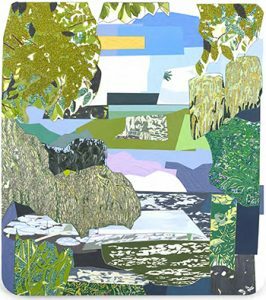 This exhibition presents a selection of collages and mixed-media paintings inspired by Thomas’s time in Giverny that throws the continued relevance and influence of the nineteenth-century father of Impressionism into new relief. Mickalene Thomas is a native of Camden, New Jersey, who currently lives and works in Brooklyn, New York. She earned her BFA from the Pratt Institute and her MFA from Yale University. Her work has been the subject of solo exhibitions at the Brooklyn Museum of Art, the Santa Monica Museum of Art, and the Institute of Contemporary Art, Boston, as well as numerous gallery shows. Telfair Museums’ Friends of African American Arts (FAAA) is honored to welcome the esteemed speaker Deborah Willis, PhD, to Savannah to give the 2015 Jacob and Gwendolyn Lawrence Lecture. Dr. Willis is Chair of the Department of Photography and Imaging at New York University’s Tisch School of the Arts and is a noted photographer, author, curator, and scholar. Dr. Willis was a 2014 Cohen Fellow at Harvard University, a 2005 Guggenheim Fellow and Fletcher Fellow, and a 2000 MacArthur Foundation Fellow. She received the NAACP Image Award in 2014 for her book with Barbara Krauthamer, Envisioning Emancipation. Her book with Emily Bernard, Michelle Obama: The First Lady in Photographs, was a winner of the NAACP Image Award in Literature. 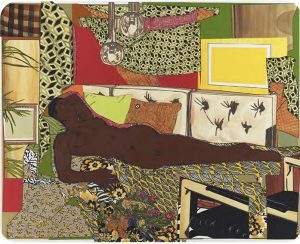 Dr. Willis’s lecture, “Critical Narratives in Visualizing the Black Body in Art and History,” will refer to Telfair’s Mickalene Thomas at Giverny, and will focus on the work of Thomas and other contemporary artists restaging art historical scenes. This lecture is presented free of charge thanks to funding from the Jacob and Gwendolyn Knight Lawrence Foundation and by the City of Savannah’s Department of Cultural Affairs. A reception will follow the lecture, hosted by Telfair’s Friends of African American Arts.